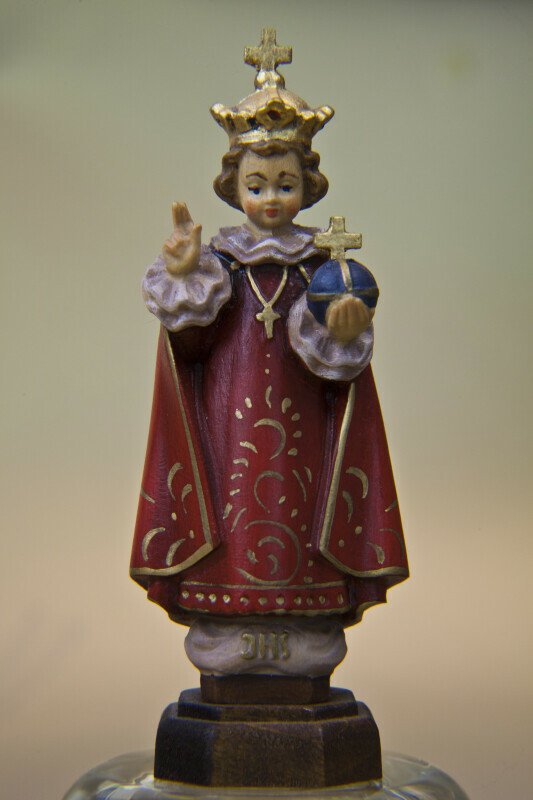 Infant Jesus of Prague wood carving that is hand painted in red, white, blue, and gold. The right hand of Infant Jesus is raised in a blessing, while his left hand holds a sphere surmounted by a cross, also known as a "globus cruciger" (Latin for "cross-bearing orb"), which signifies that the whole world rests in his hands. He is wearing a red robe and has a gold crown on his head. This small statue is a replica of The Infant of Prague wax-coated wooden statue located in the Carmelite Church of Our Lady Victorious in Malá Strana, Prague, Czech Republic. The initials "JHS" (first three letters of the Greek name of Jesus) appear on the front of the statue, and the sticker on the bottom says "OTCO." The figure stands 4 (10 cm) inches tall.